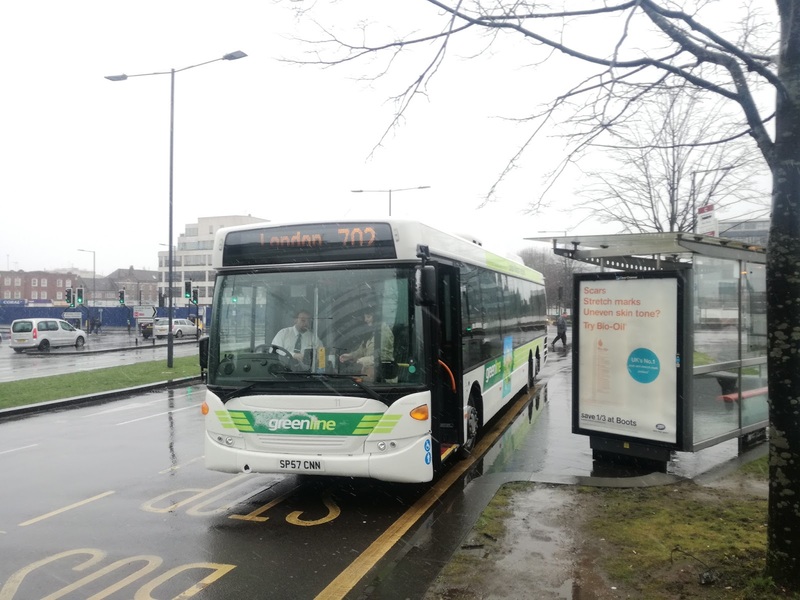 In Part One I had sampled some of the fleet Reading Buses are operating on the Greenline 702 service between Bracknell and London, and had just arrived at an extremely wet Reading where I was intending to try out one of their new Scania E400citi gas buses. 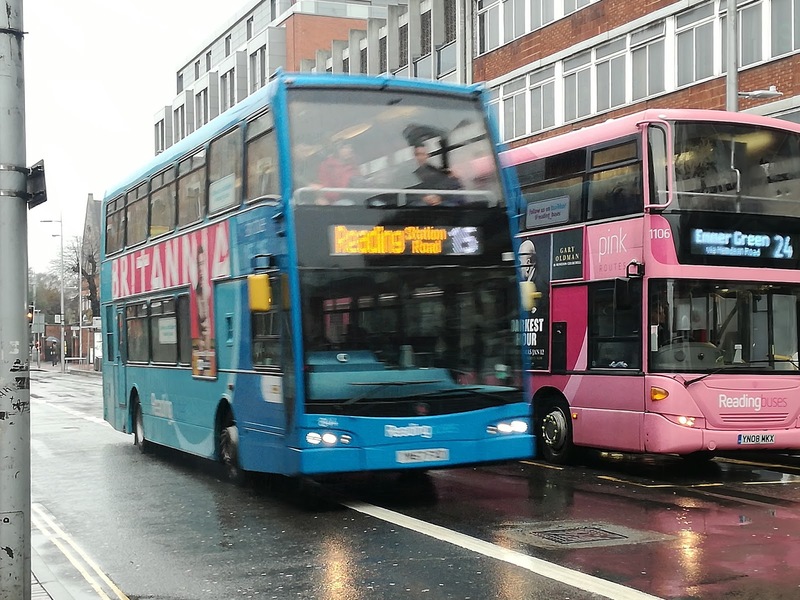 The first thing that struck me was just how many buses were operating in Reading on a Sunday. You could be forgiven for thinking it was a normal weekday. The 17, for example, which the gas deckers are operating on, operates to a 10 minute frequency - on a Sunday! This meant despite the extreme wetness and gloom photo opportunities were numerous, and it must be said that Reading does have a very attractive fleet and livery scheme, of which I think a lot has to do with Ray Stenning and his Creative Desire team, who are responsible for most of the decent liveries around the country. Here are just a few examples of what was on offer. However it was the 17 I was there for, and soon enough one of the Scania gas deckers arrived. 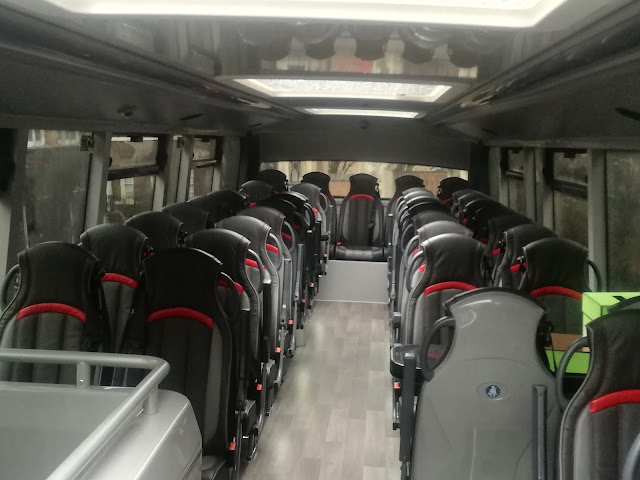 This is not a particularly long route, yet the buses are high specification. Comfortable seats, WiFi, USB chargers, 2 wheelchair/buggy spaces, and, a first for Reading Buses, centre doors to improve loading/unloading times. And there is absolutely nothing wrong with them. 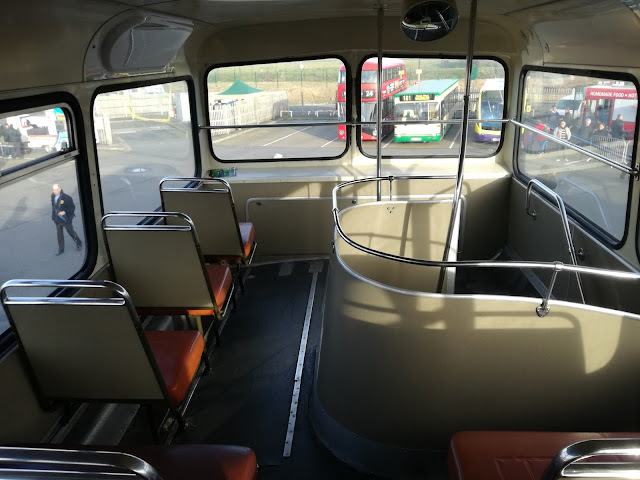 It didn't feel or sound different to any other bus, yet there was that distinctive ADL ride - suspension a tad hard and the feeling that the next pothole could have it rattling like a 1940's football crowd. 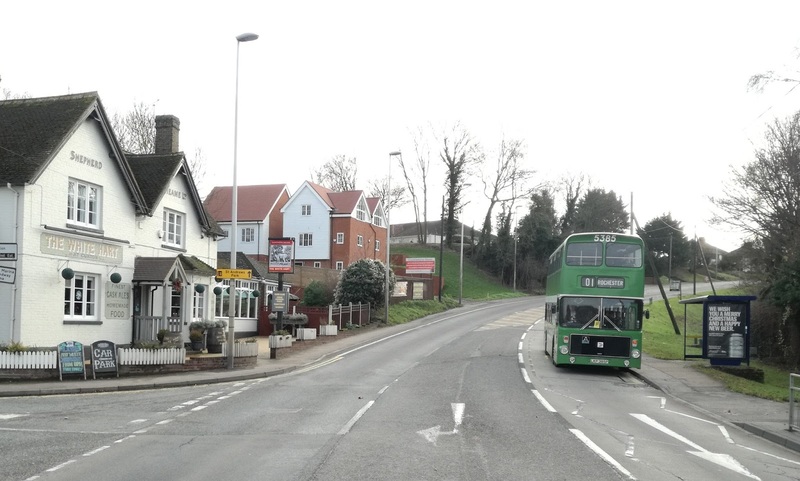 However I know full well that John Bickerton and his engineering team at Reading Buses won't allow that to happen. On board information is clear yet unobtrusive and it seems a great deal of thought has gone into these buses. At the terminus I spoke to the driver, whose opinion is always important and he was very impressed with them. 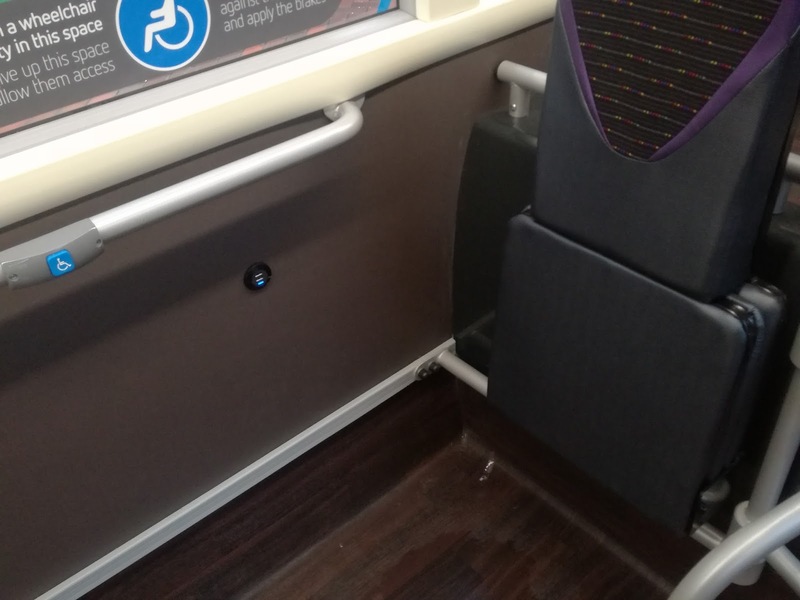 You will see from the above picture that the wheelchair bays have USB points too. 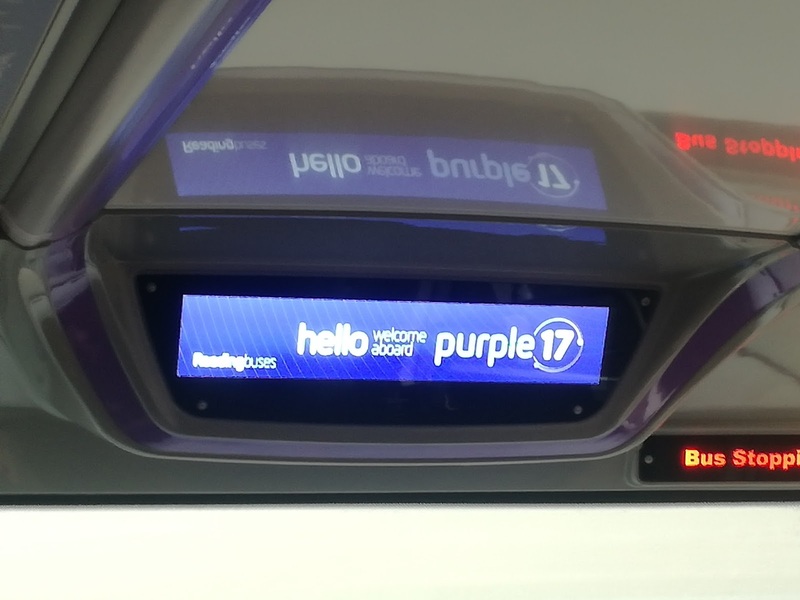 This detail has been missed on many buses so it's good to see Reading Buses include it. 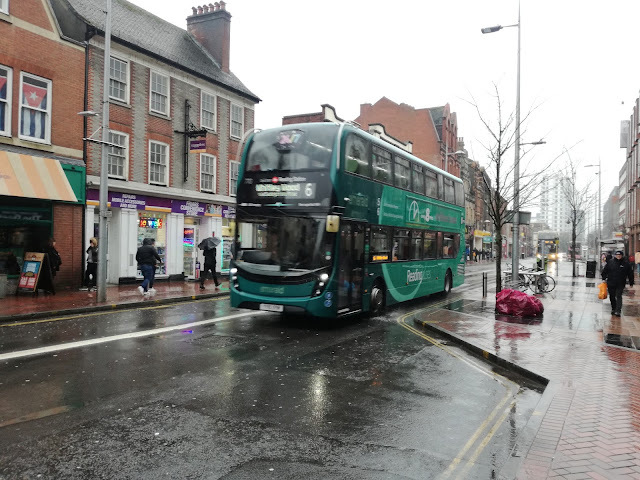 I will be back to Reading soon, firstly to see what a week day service looks like, to get some photos in decent light, and to try out one of their fabled Streetdecks that don't rattle! 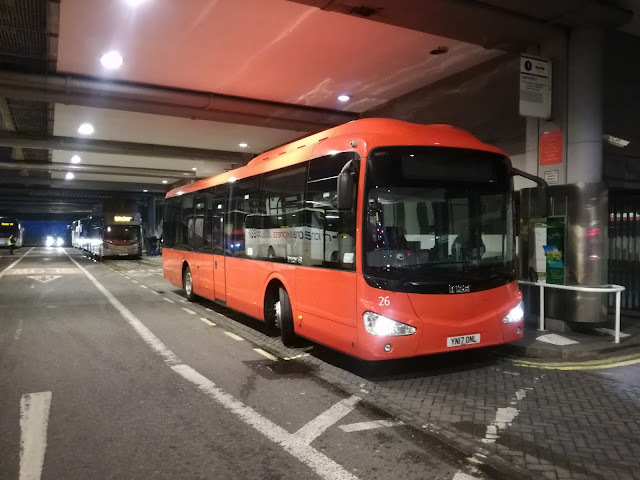 I caught the X4 back to Bracknell, another rocket E400 hybrid - if only all E400's were this standard - and discovered something else. 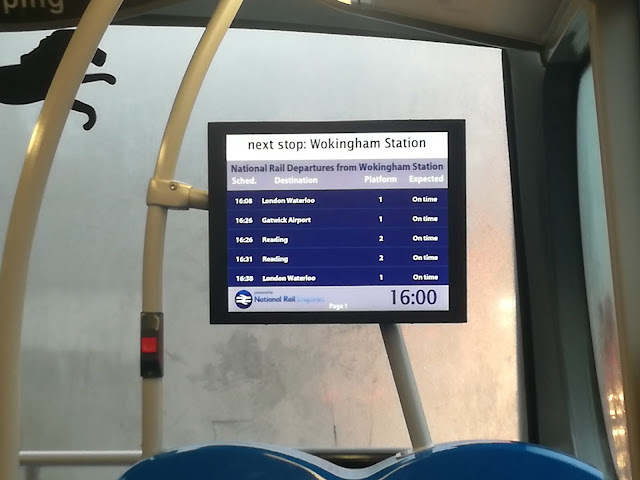 As I was sitting further back I could see the information screen, and as we approached Wokingham Station saw to my amazement that the screen was showing real time train information. 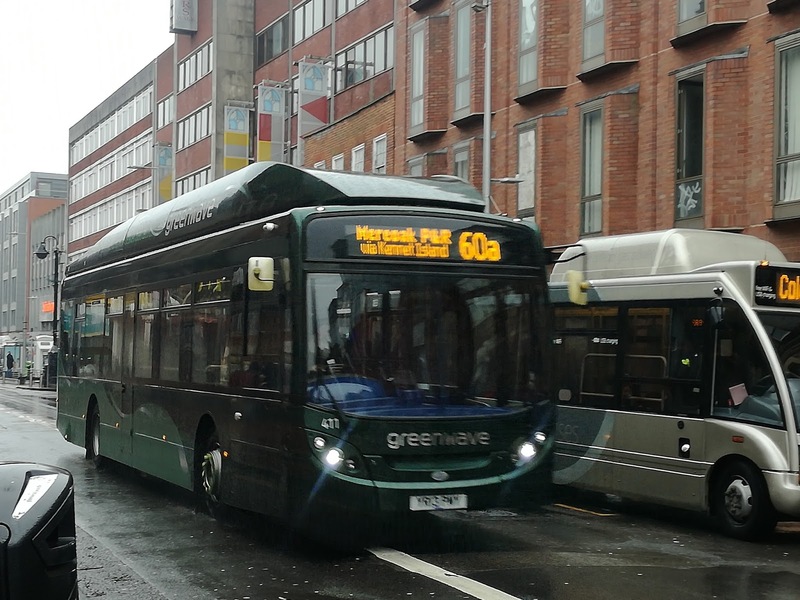 Now that is impressive, and I'm looking forward to First and Konect to do the same in Norwich! Nope not holding my breath either! Btw the weather was so foul nothing would have stopped the windows misting up so no criticisms there. I have no idea why but the Iriza felt a lot nicer in the evening than it did in the morning, it was certainly warmer which might have helped, and it wasn't long before the day caught up with me and I fell into a rather enjoyable snooze, which lasted until Slough, when everyone was de-bussed and transferred onto an old Scania Omnicity as the Iriza had to go back to its Newbury base. I was just waking up and processing what was happening when there was a knock on the window and the grinning face of Martijn Gilbert jerked me into life. He gave me the option of carrying on to London or hanging around with him for a bit. No contest, so I avoided the Omnicity and spent the next few hours with Martijn. Now let's put things into perspective here. 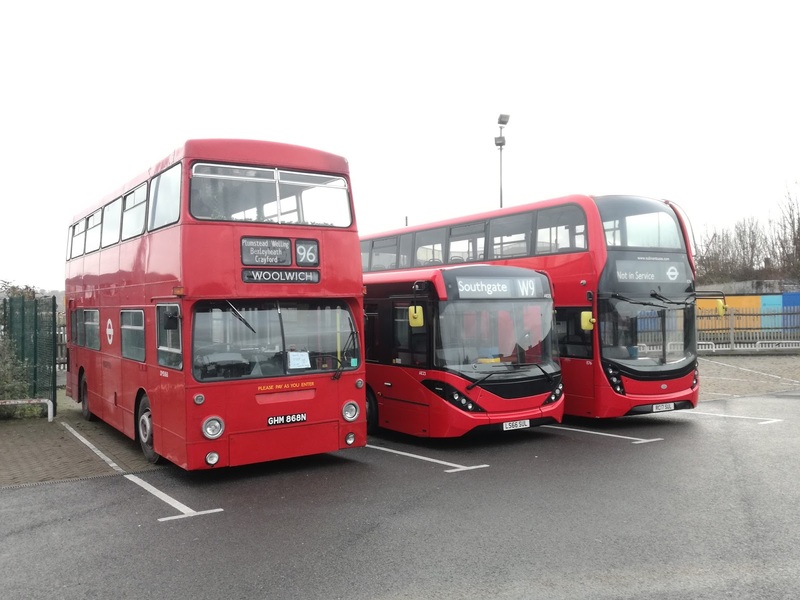 Martijn is the CEO of Reading Buses, who employ some 650 staff. Yet here he was, on a dismal Sunday evening, in Slough, making sure the new Thames Valley services, that Reading Buses had started to operate, replacing First Berkshire, were doing ok. Because the new local office wasn't quite ready yet that meant collecting takings, cleaning and washing buses and basically doing stuff you would never see the CEO of any other operator that size doing. I went with him to a local garage to jet wash one of the Solo SR's and it became truly obvious just how much respect and value Reading Buses has for its staff. The driver who was on his break, Steve - obviously a lovely chap - came with us but Martijn insisted on driving as Steve was on break. As Steve volunteered to go back and fuel up hs Solo when he had finished his duty Martijn promptly gave Steve his hi viz jacket. Class. Unlike the DMS in December, Martijn managed to get us there and back without breaking down! Martijn and Steve at the Slough bus wash! After all the Solos had been deemed fit for service the next day Martijn suggested adjourning to a refreshment establishment, so after a very long walk trying to bypass a huge shopping centre and find the High Street, which my side strain just adored, we ended up in KFC where I really got to pick Martijn's brains and delve into the philosophy that has made Reading Buses such a success. The mantra is quite simple. 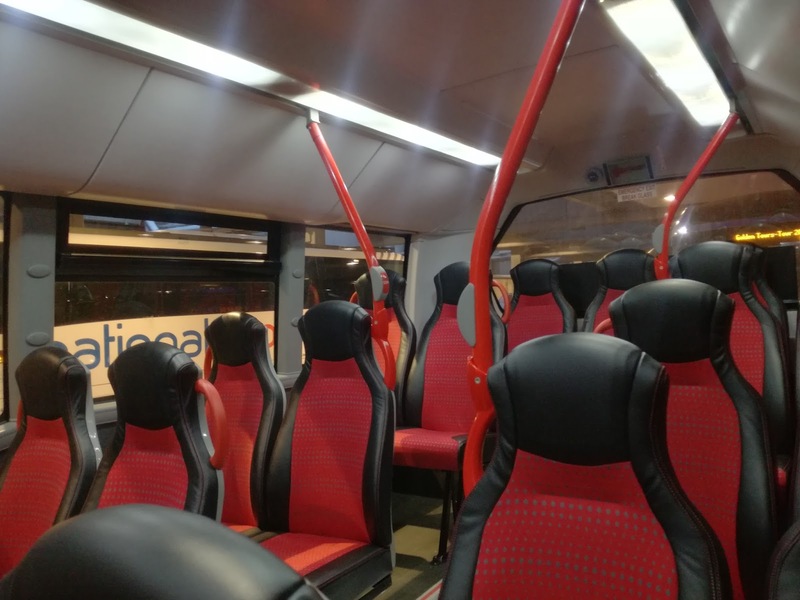 As Martijn explained, a bus can be as attractive as you like from the outside, but if it isn't a nice place to be on the inside then you won't encourage passengers to become regulars. That, I'm overjoyed to say, includes rattles. 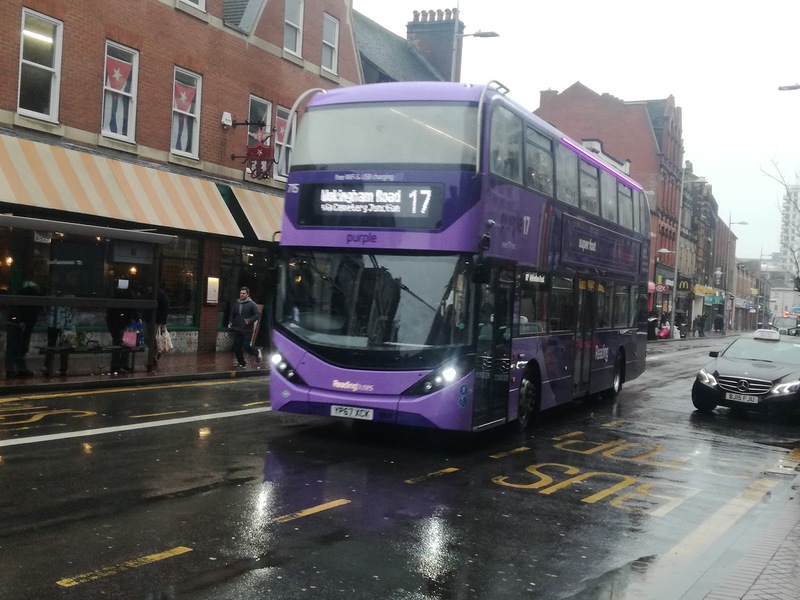 Reading Buses are one of the very few operators to work with (nag) manufacturers to reduce background noise while buses are moving. if only one of the big boys would do the same we might get somewhere. Certainly no Reading bus I went on rattled, but what about those Streetdecks? I have been invited to the depot for a guided tour, and full explanation as to how the Streetdecks have been conquered, but as I understand it they have been fitted with Borismaster running gear - also built by Wright, remember, which has seriously improved the ride quality and background noise. 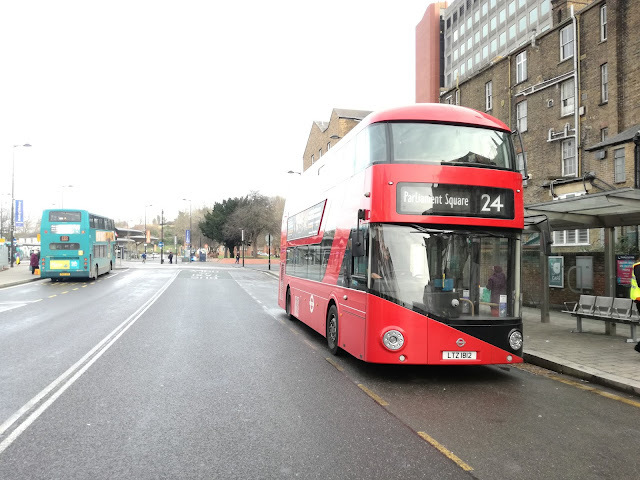 If that is true then it does beg the question why the Streetdeck doesn't come with this option anyway. Martijn was anxious to hear my verdict of the gas deckers, particularly asking about engine noise. Not noticeable upstairs, Martijn, but I'll sit downstairs next time and let you know! We could have nattered for hours, and probably will in the future, and I was left almost jealous of the good folk of the Reading area that they have such an excellent bus service, with an equally good fleet, and in Martijn and John arguably the most dynamic and forward thinking management team in the country. 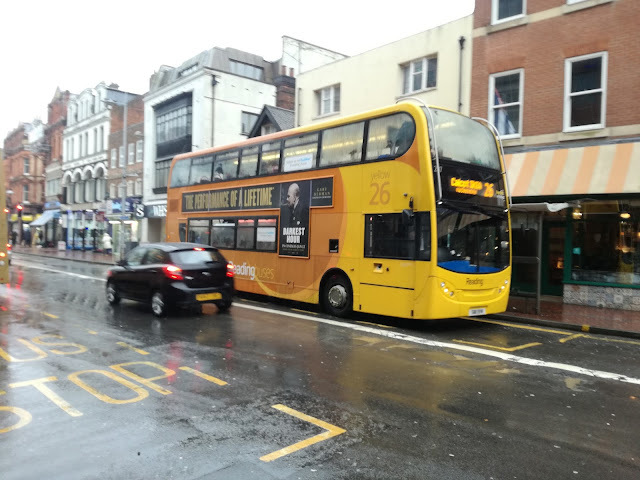 The thought of such dynamics, investment, consideration for the passengers and staff is almost unthinkable up here, and I still can't get over just how many damned buses there were in Reading on a Sunday. Just shows it can be done with the right attitude, the right people, and decisions made by bus people, not ruddy accountants in an office 500 miles away. Martijn, it was an absolute pleasure to spend time with you, to witness your passion for getting things right, and mucking in getting your hands dirty. That's how to generate respect, and my word you have mine! 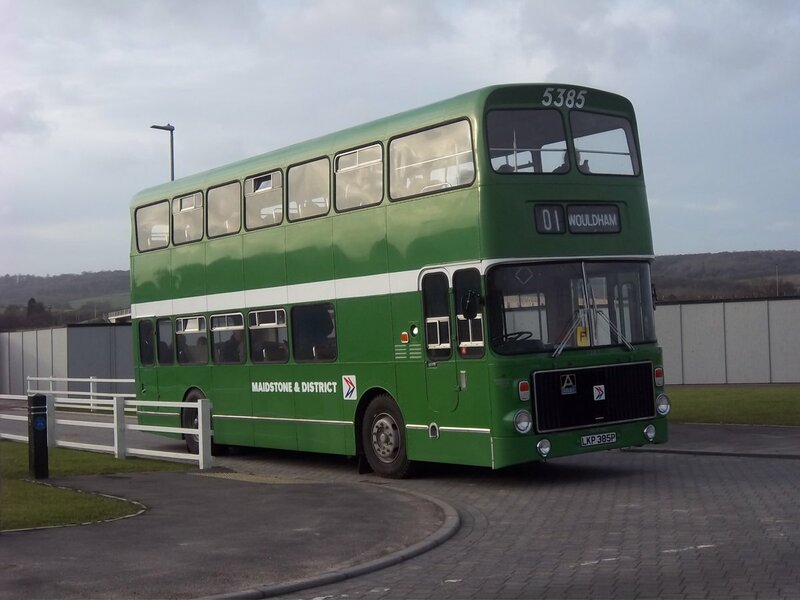 I had missed the last bus back to London thanks to spending time with the boss of the operator of the buses to London.....irony?....so was forced, kicking and screaming to get the train back from Slough which just so happened to be a GWR Intercity 125. Damn!!!! We arrived at Paddington alongside the Riviera Sleeper to Penzance, which had a stand in loco on the rear. Won't get pics like this for much longer. I had pondered nipping to London Bridge to see the new station, but engineering works on the Underground put pay to that, and I was getting exhausted! So I made my way back to Upminster via 3 Tube journeys, which included a white knuckle ride on the Bakerloo Line - goodness he didn't hang around - and drove home reflecting on a long, wet, cold, but highly rewarding day. What were you doing at 4am Sunday morning? If you had any sense you were in bed. I was in the car driving to Upminster to start the first epic day of the year. I hadn't planned to - the weather forecast was truly awful and the day had been marked as a strictly TV sport day. 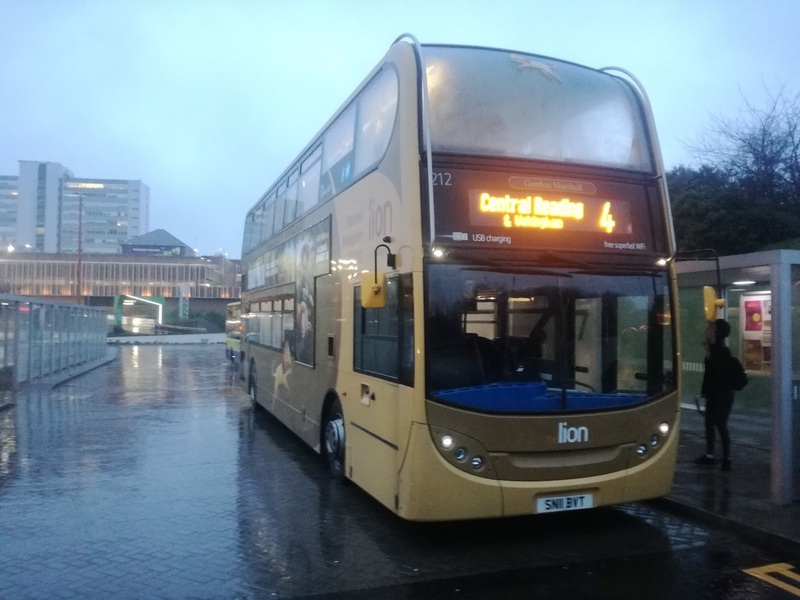 Then I found out that Reading Buses had secured the 10,000th ADL bus to be built - a high spec E400 MMC, which apparently was given the full treatment and was a must to travel on. Since Reading only had it for a few days, and were using it on the Greenline 702 between London and Bracknell, Sunday was the only day I could make it down there. So I found myself at Upminster station at a silly time waiting for the first C2C service to Fenchurch St - a first for me and the only London rail terminus that had somehow avoided me over the years. It was 15 mins late due to overrunning engineering works but hey ho, it was warm and smooth when it turned up. 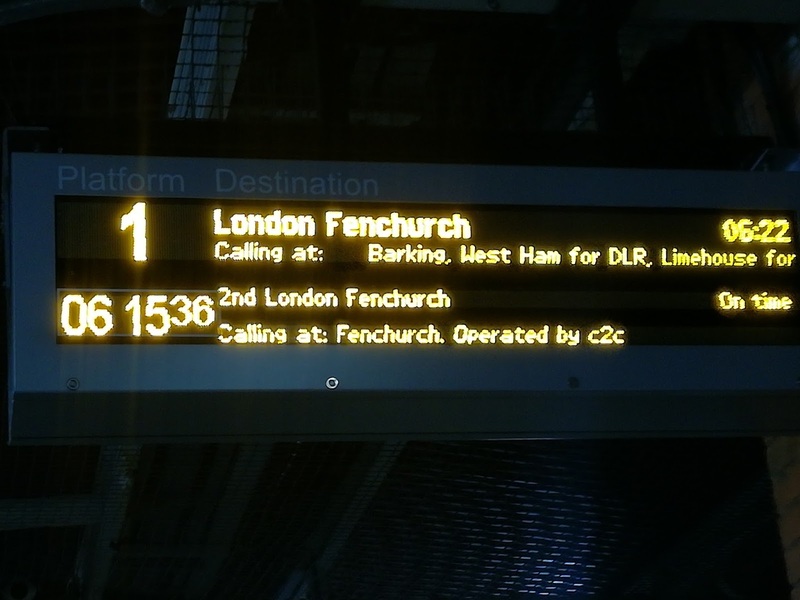 Wonder why it only says Fenchurch? A short walk to Tower Hill Underground station, District Line to Victoria, a stroll through Victoria Place and I was at the lesser known of the 4 Victoria Bus/Coach stations (There are 2 separate coach stations for arrivals and departures) where the 0800 702 to Bracknell was sitting on layover. 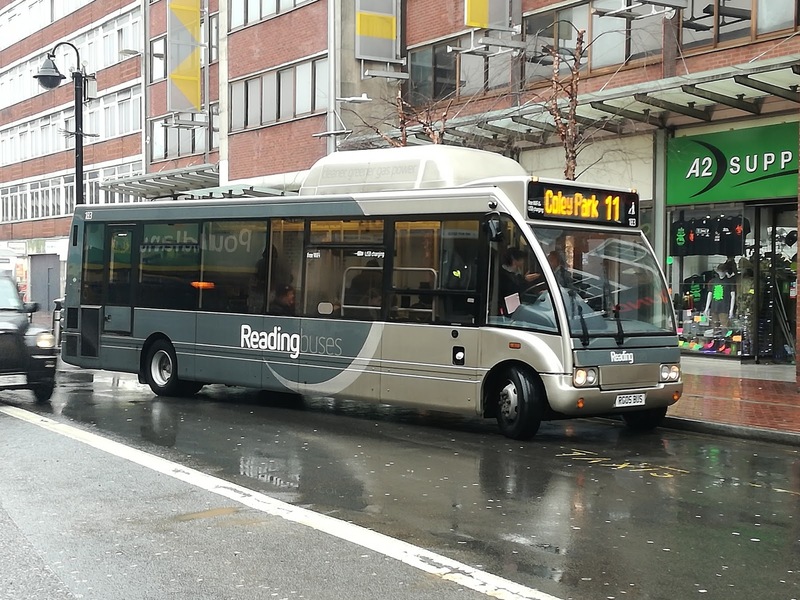 The CEO of Reading Buses, Martijn Gilbert, of whom much more later, had kindly told me what the MMC's were doing (the Scania MMC demonstrator was also on loan), but I also knew the very rare Scania Iriza i13 single decker was on the route, and to my delight was operating the 0800. Normally confined to contract work in Newbury it is a blue moon to see it in general passenger work and I had been told they were pretty good. Unfortunately the destination display hadn't agreed to Sunday working, although it did subsequently reluctantly settle on a late start, but my first impressions were the Iriza is a nice place to be. Decent seats, nice interior, and theatre style tiered seating towards the rear, which wno't be to everyone's taste but does help with forward vision. Long time readers of the blog will know, despite derision from parts of Kent, that I regard the best single deck bus ever built to be the MAN Ecocity gas bus. It has set the bar very very high. Could the Iriza match it? Well sadly not quite. 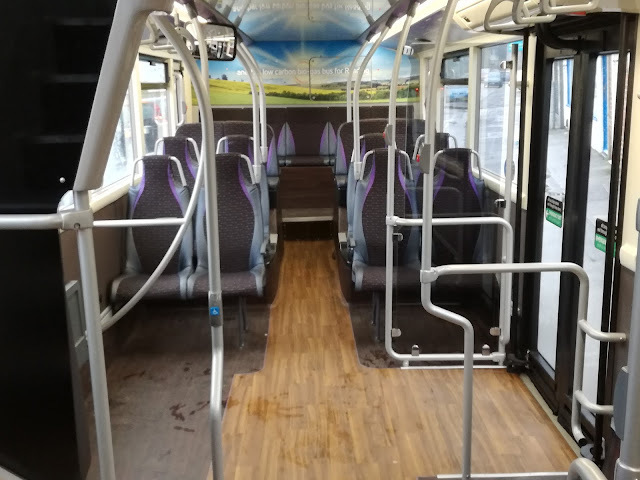 Don't get me wrong it is a lovely bus, certainly up there with high spec Citaros and better than anything the big boys at Wright and ADL have to offer, but a bit noisier than the MANs, and a little more body noise than I was hoping for. However, to anyone who didn't travel on the MANs before Go Ahead wrecked them I can fully understand why they are claiming first prize for this Scania. 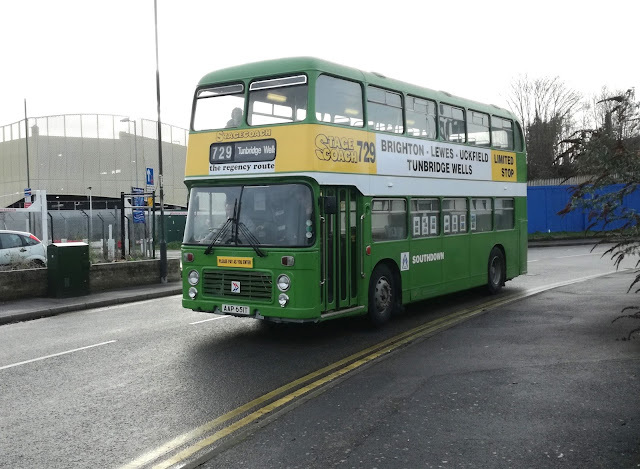 I would never complain if it turned up, and indeed I organised what I thought would be my return trip from Bracknell to get another ride on it. 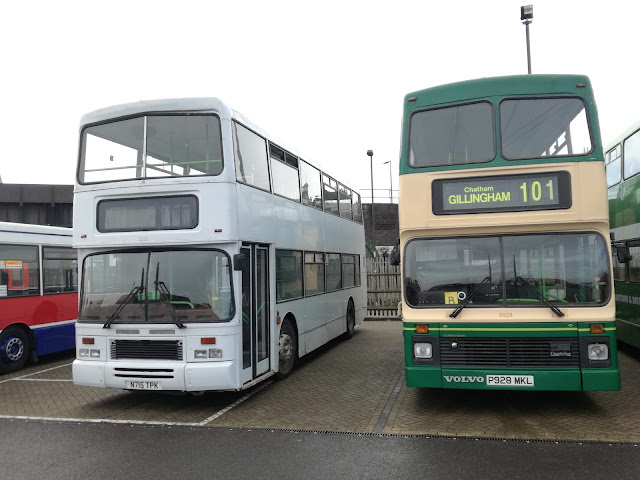 A couple of boomerang journeys to Slough beckoned before getting ADL 10,000 to Bracknell. Reading buses have taken a two Stagecoach Scotland tri axle Scania Omnilinks on loan for the 702 and they look rather good it must be said. 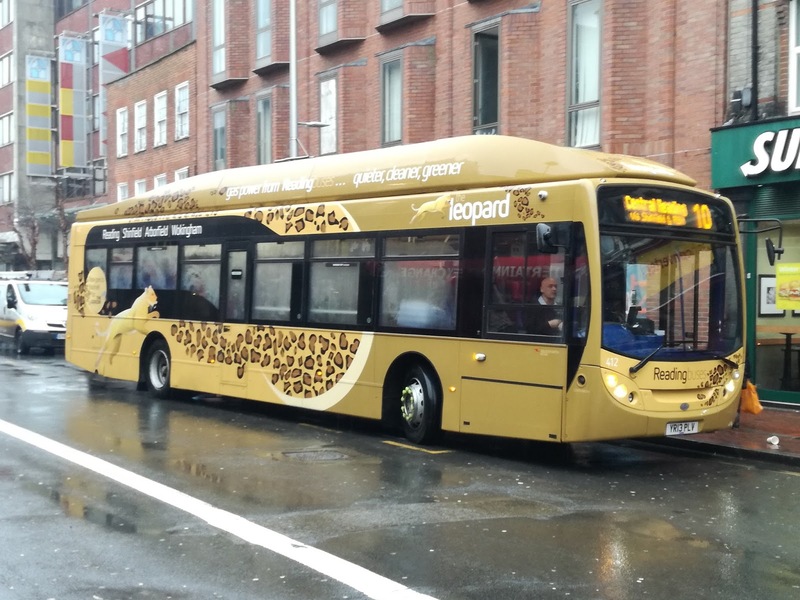 Fitted with Stagecoach Gold seats and superb heating which was necessary as it was snowing very hard these are really nice buses Yes they rattle a bit but then they are 10 years old so allowed a bit of leeway there. A very nice, if short trip to Slough. 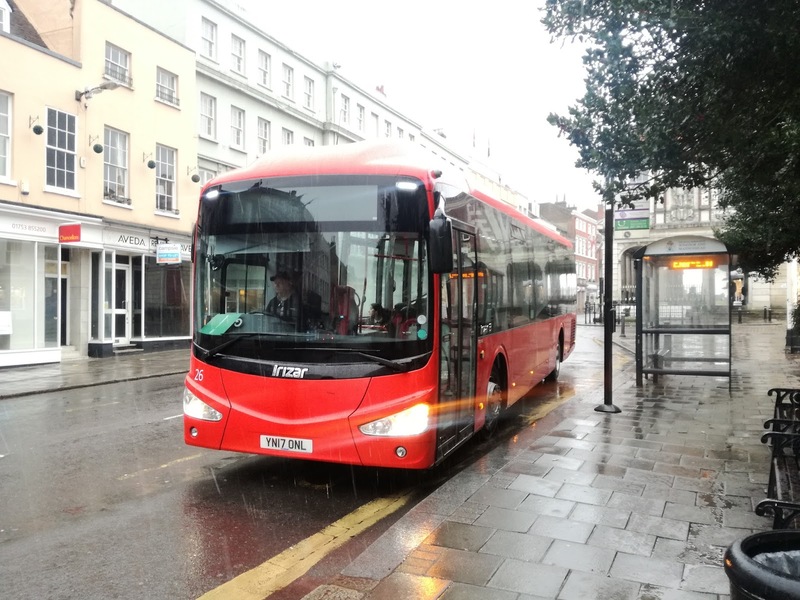 I returned to Windsor on the Scania E400MMC demonstrator that First had on trial on the X1 last year, and I knew I wouldn't like it. I didn't. Noisy, rattly and cold. Very cold. Enough said. Back to Slough on the other Omnilink, which was even nicer than the first. Made a mental note to do the whole trip on one of these before they are replaced. 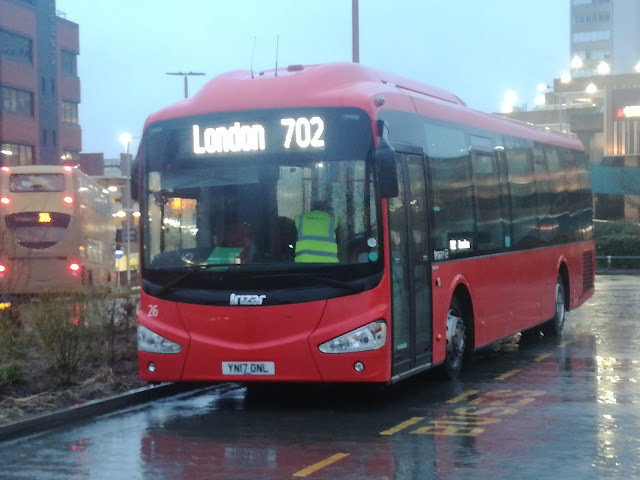 Back to Slough Bus Station to wait for the whole reason to be there, the 10,000th bus built by ADL. Even in the gloom and grey it looks very impressive from the outside. Inside there are nice looking seats that have no foam but some new fangled material that makes them lighter. 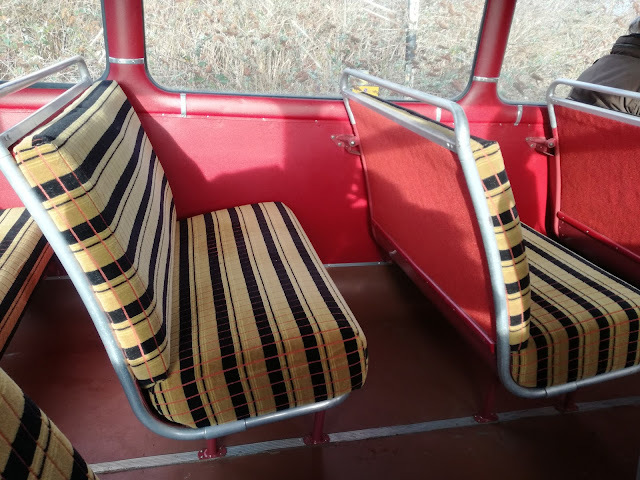 It also makes them less comfortable than the Irizar or Omnilinks, but still more confortable than the new train seats the DfT expects us to sit on. 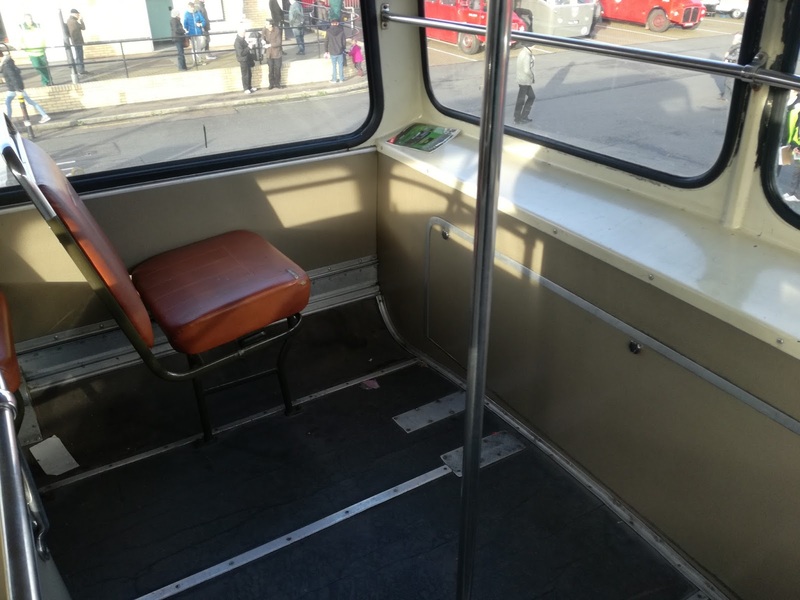 USB chargers, seat tables, coat hooks and even phone holders are present, because we all know how tiresome it is to hold your own phone while on a bus. Glazed panels line the roof, which when it's raining heavily sounds like you're in a greenhouse, and when the sun beats down on them will undoubtedly make it feel like one too. 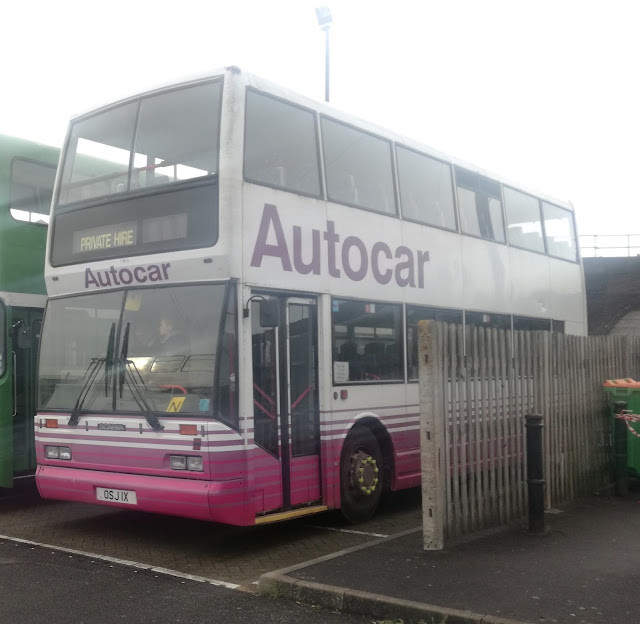 And being ADL it comes with creaks and body noise that just shouldn't be present on a brand new bus, not to mention hard suspension, and this is one they are showing off round the country all year! Was it better than an Olympian? No. Was it better than the Astromega I rode the route on 4 weeks previously? Erm no, it just wasn't! 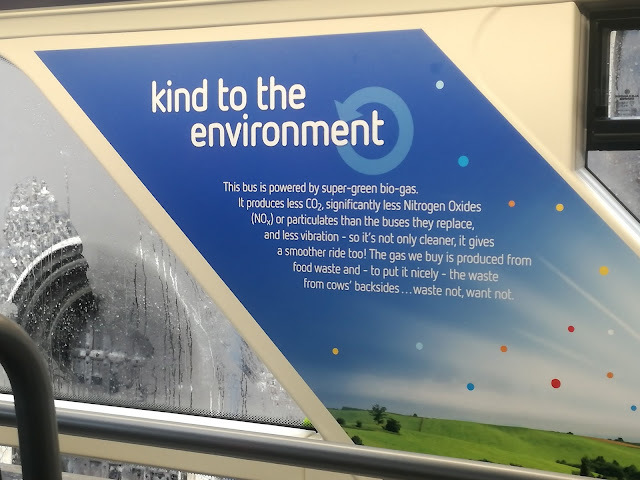 Oh I expect fuel economy and emissions are better but ask passengers if they take that into consideration before leaving the car at home. Yet again I left an ADL bus feeling cheated as it could, and should be so much better. What did strike me throughout the day, though, was that every single bus on the 702 was on time, the drivers were friendly. and handled the appalling conditions with professional competence. 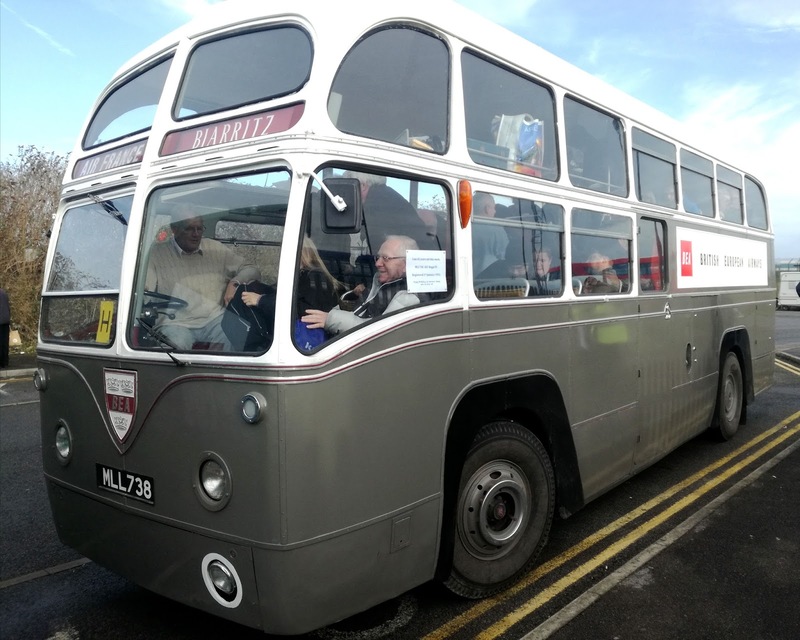 The weather undoubtedly kept a few people indoors but that made it more spacious on the buses which was good for evaluation purposes. 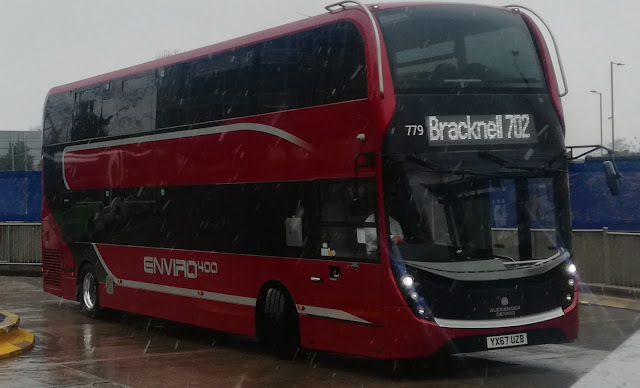 At Bracknell the snow had turned to heavy rain and it was a quick transfer onto my next bus, the X4 to Reading, on one of Reading Buses' Lion Route branded 11 plate E400 Hybrids. Except these are hybrids the like I haven't travelled on. No gimmicky electric engine taking you to 10mph before waiting a month for the diesel engine to kick in. Oh no, these keep the diesel engine running to power the generator and the buses simply fly! The acceleration on them is astonishing for an E400 and they sound completely different too. 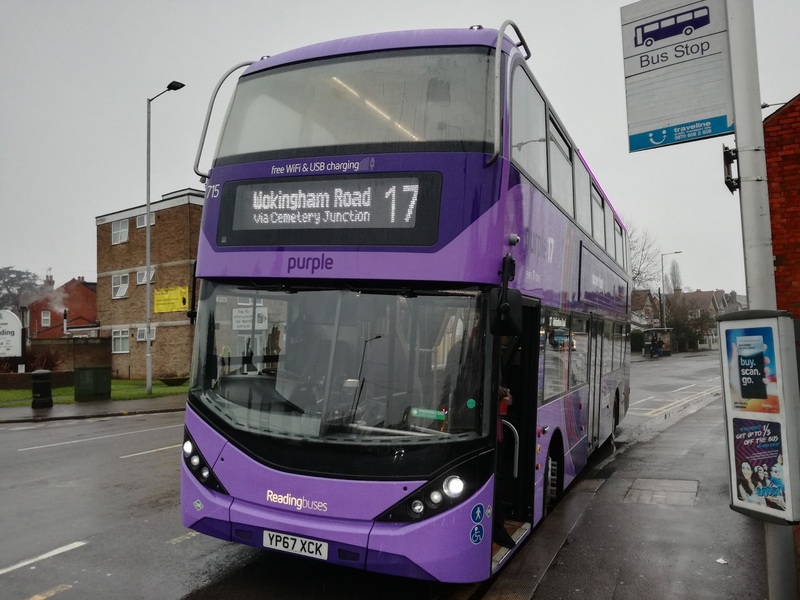 Oh and no rattles, thanks to the dedication and diligence of John Bickerton and his team at Reading Buses, who sing from very much the same hymn sheet as myself when it comes to rattles. 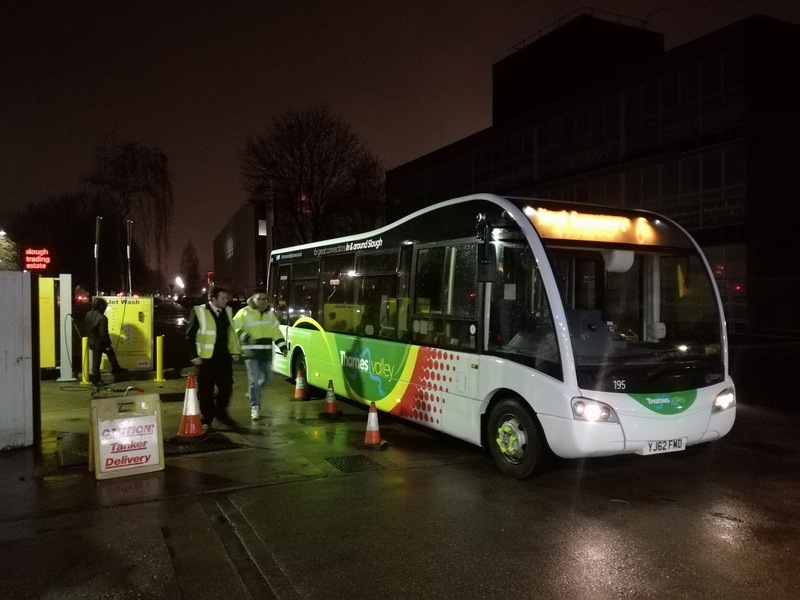 There will be far more of this in Part Two, when I report on my evening spent with Martijn Gilbert, and the highly impressive ethics he follows which has made Reading Buses one of the most respected operators in the country. 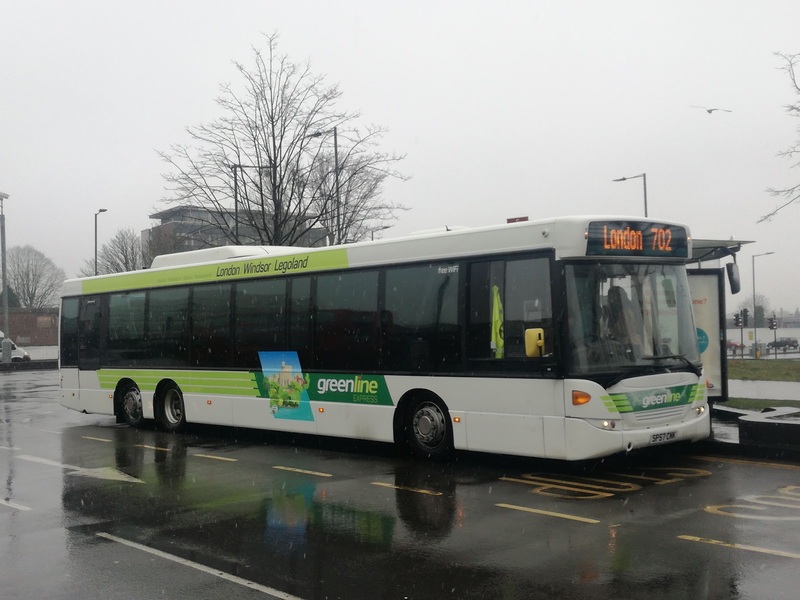 I was in Reading to sample the new Scania E400citi gas double deckers, and Part Two will start with that. Although I had been on the go over 10 hours the best was yet to come! 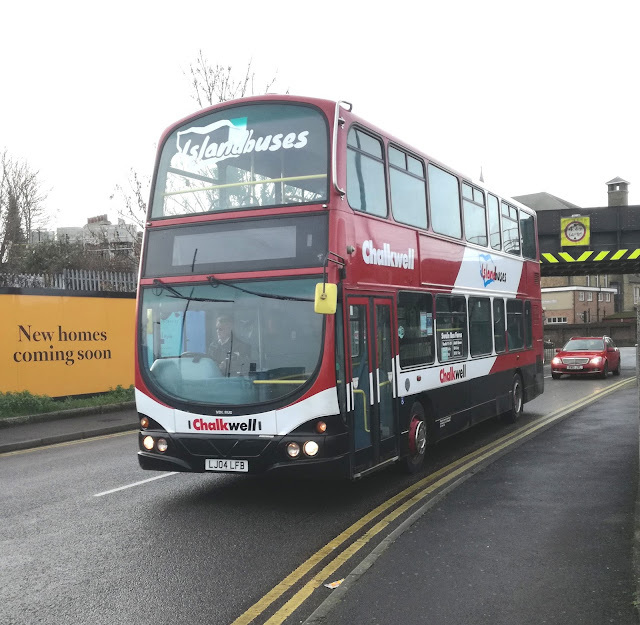 Happy New Year everyone - that's wishful thinking isn't it on the day 5 train operators are affected by strikes and Ipswich Borough Council announces it's bailing itself out so evening and Sunday bus services in Ipswich can continue. So I thought I'd gaze into the crystal ball and predict what's going to happen this year in the East Anglian area of public transport. We'll start with buses. 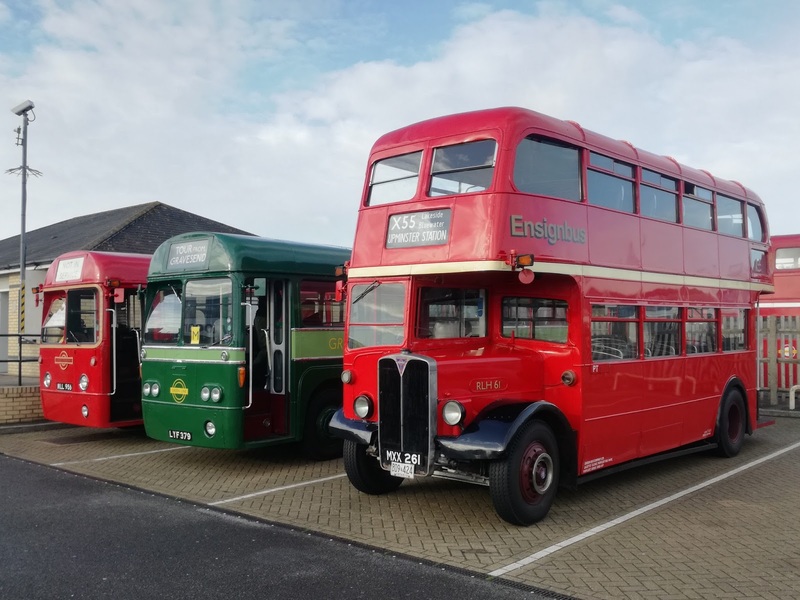 Let's be frank here, not even the most optimistic of crystal balls can come up with anything remotely positive for East Anglia regarding bus services. More subsidy cuts loom threatening to cut off yet more isolated rural areas. We are all waiting to see how big the axe is, but an axe there will be. At the same time Reading Buses are introducing gas double decker buses, and Transdev revolutionising bus travel in the North including the most luxurious seating ever seen on buses over here the comparitive apathy will continue. Not that I'm blaming local management who in some cases work miracles with one hand tied behind their backs. 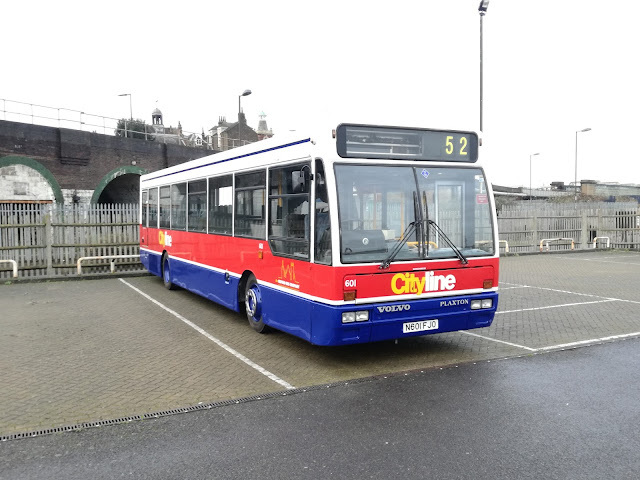 But all the time our bus services are dictated from Aberdeen and Newcastle, not to mention how much of our Council Tax is put back into public transport then we stand no chance. There are still no hybrid buses in Suffolk or Norfolk. Go Ahead seem Hell bent on destroying everything they have in the region, First still can't decide on a replacement bus for the E400's on the X1, or XL as it's ridiculously going to be called on the Western side. 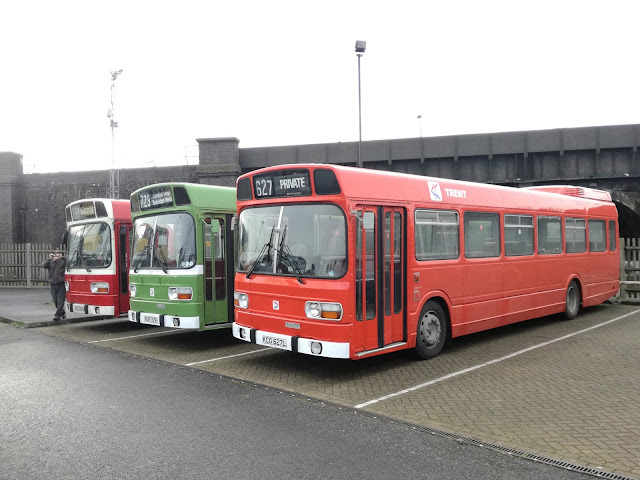 The modernisation of Ipswich depot STILL hasn't happened meaning 15yo deckers can't be replaced. 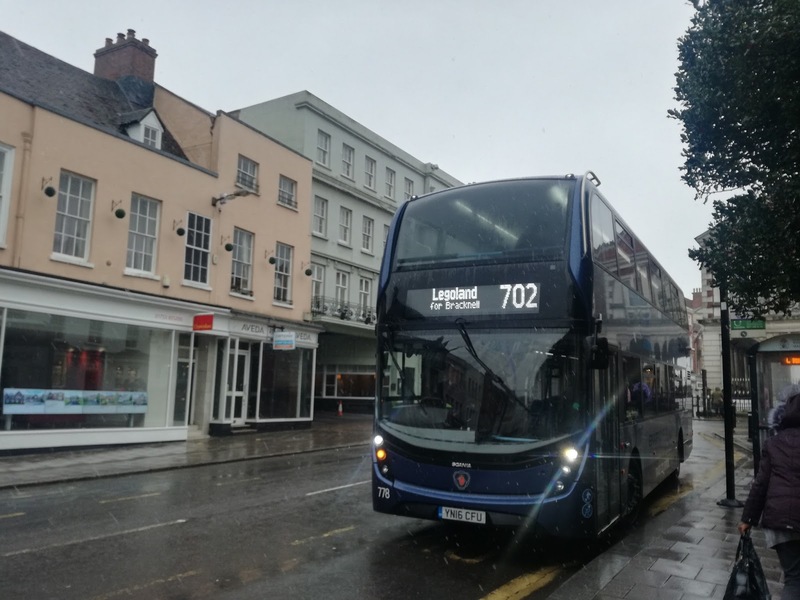 Speculation over who will buy Ipswich Buses will continue, with no one actually wanting to buy it as Ipswich is such an island and can't be linked up with anywhere else. I do predict more investment in deckers at Borderbus though. The 146 is really taking off now, as is the 580. Deckers may become necessary. However I do feel that the system of taking passengers into Norwich on deckers to a half hourly frequency only to expect them to tolerate an hourly frequency single deck service to return on needs to be looked at. It could be the 146 is now too popular to be worked around school services, a victim of its own success. 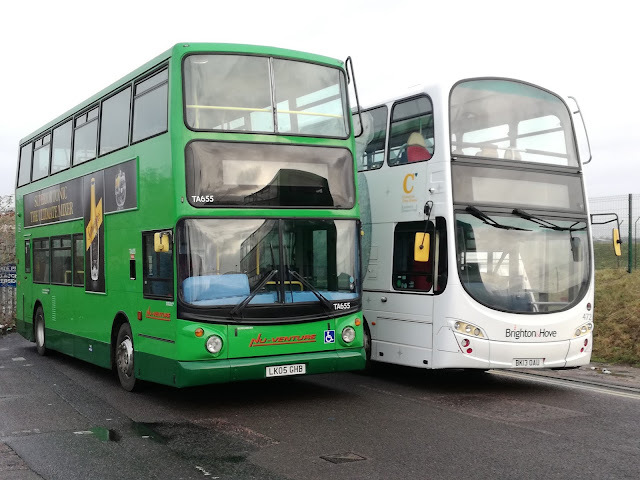 With no Anglian around Kessingland now more people, especially tourists will start choosing Beccles and Norwich, and if the service isn't there to cater for them, especially PM then it will be an opportunity missed. If First have any sense they will restore the Kessingland - Yarmouth through service vacated by Anglian as the Pontins crowd like that. Either that or Borderbus introduce a Kessingland - Beccles - Yarmouth service incorporating the 580. There are openings for the courageous out there, but is anyone courageous enough? From an enthusiast's point of view East Anglia will become less and less attractive. There really is nothing in the region now to whet the appetite compared to other parts of the country. Hate to say it but it's true. So let's switch to the railways. Here we have total confusion. Every TOC you listen to is boasting of investing in new rolling stock. Nothing to do with the fact DDA for trains comes into force in 2020 then, which means no more slam doors anywhere, or toilets that dump onto tracks, and disabled facilities in every train. 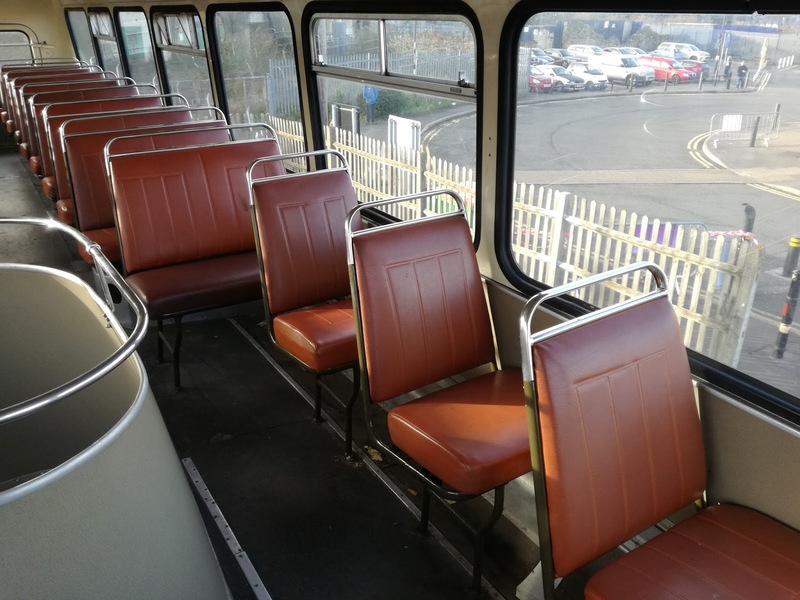 Or that the Department of Transport has dictated that the most uncomfortable seats in the history of railways be installed on the new trains. Yes, the government decide on the new rolling stock specification, not the operating companies. So when you board one of the gleaming new Greater Anglia trans next year don't blame them. 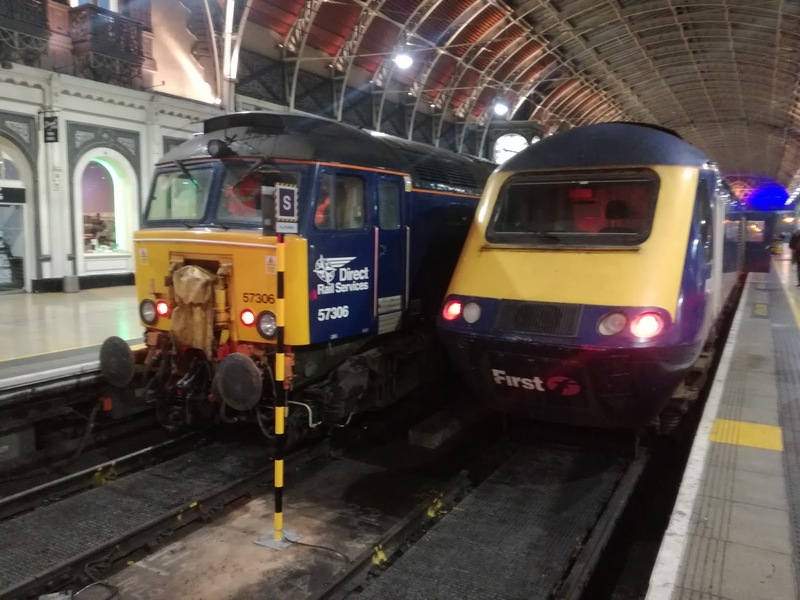 The new trains won't stop the regular signal and points faiures, late running freight trains or bridge bashes either, you'll just be delayed in less comfort. Guards or no guards, how many more strikes before common sense makes a breakthrough. Until then we still have the Class 37 hauled short set for another year, regular test trains, excursions and charter trains to keep us amused, although I'll be surprised if we have the Flying Scotsman, Tornado and Union of South Africa visit our shores in the same year again! Make the most of the variety of rolling stock on offer this year, as next year it will become very 2 dimensional. Well that's all very depressing isn't it. Sorry about that. If anyone can find a glimmer of positivity around feel free to let me know and I'll be overjoyed to publicise it Is Essex any better this side of Chelmsford? What are the solutions to bring public transport in this region out of the doldrums? Will I be able to feel more upbeat this time next year? Discuss! On the seventh day of Christmas Nu Venture gave to me, a really good running day! I attended last year's event, held at Asda in Gillingham. It was bitterly cold, and while it was ok it never really got the juices flowing. This year was different, much different. Held at a dedicated coach park near Rochester Station the event was in part to celebrate 20 years of Nu Venture in Medway. To be honest I thought it was longer than that but they should know. Anyhow this event was extremely well attended bearing in mind the time of year, with a really good variety of vehicles. I arrived fairly early to get some uncluttered pictures. All the above vehicles were on static display, although the DMS did make one very late afternoon trip out. 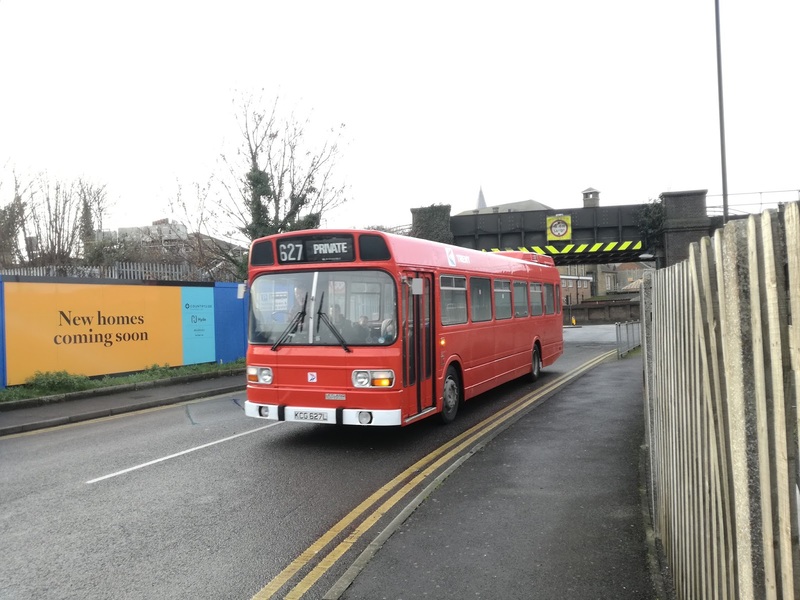 However 20 buses were out on various trips around Medway, and I managed to get on 5 of them. I must commend the organisation of this event. All buses going out had running letters which correlated to the timetables, so you could plan what you went on and when. Very impressed with that. My first ride was on the only short Boorismaster built, ST812. Not only that it was driven by Matt, a regular correspondent on this blog. It was great to finally meet you, Matt, thanks for bringing 812 and hope to see you again soon. As for 812? Well you should all know by now I love Borismasters, and although this shorter version has too few seats downstairs for my liking you couldn't fault the ride. 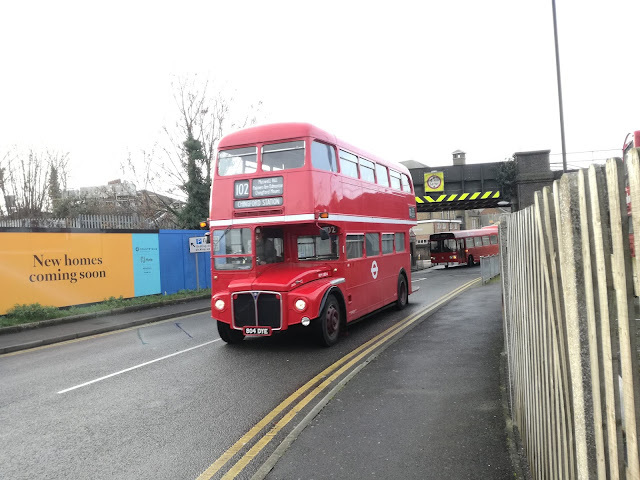 Never did I think I'd see a Boris in Medway. That was fun! Btw look at the bottom pic - when you have 3 doors which one do you have kerb side!! Medway hadn't planned for that! A kerb not designed for a 3 door bus! Some buses are a bit run of the mill, even preserved ones, but some stand out like an ice cream van in the Sahara. The BEA AEC Regal IV airport bus is one of them. It looks so quirky. 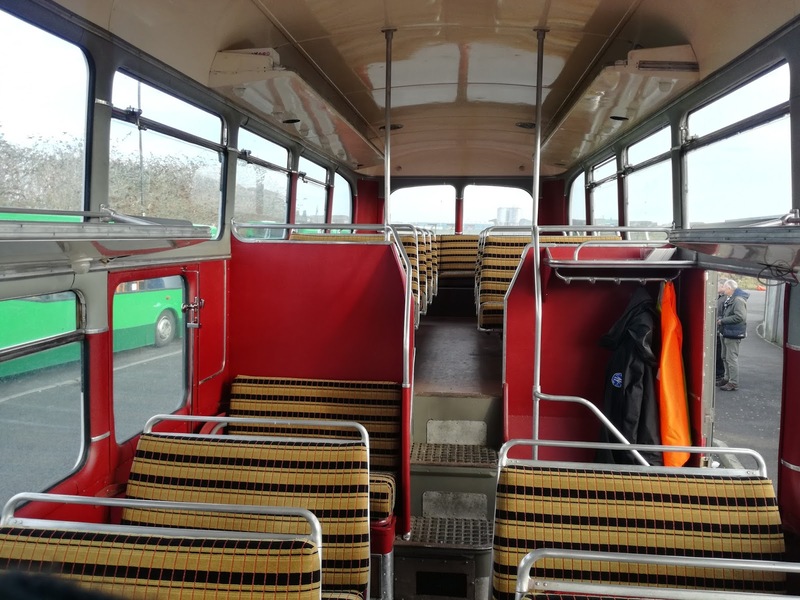 Purchased in 1953 for use on the Waterloo - Heathrow service this bus has been lovingly restored and is quite something. Old Greenline seats mean simply the most sumptuous bus seats I've sat in. Now THAT is seat padding! As we trundled along, going past my old school, it dawned on me I would happily travel on this bus anywhere, anytime and any place. I'd happily have it in service. I'd love a tardis to go back to 1953 and travel on one when they were the future. A joy to ride, and as you can imagine it was very popular. 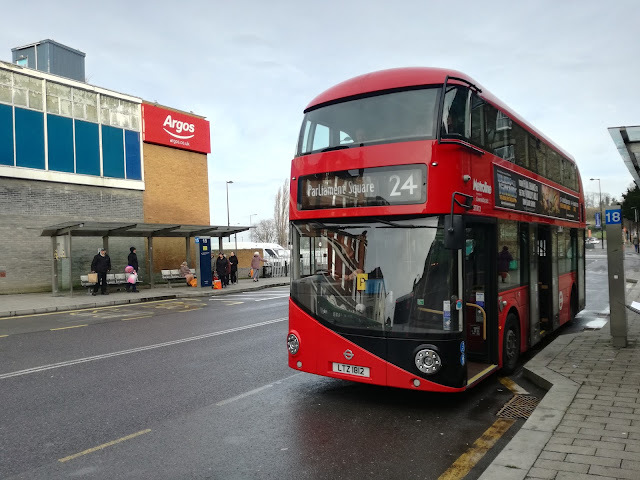 Back in Rochester I met up with my old school chum and Stagecoach South East Director Matthew Arnold for a natter before he went off to ride the Regal and I waited for my next steed. I have always liked Scanias, especially the powerful Scanias of the 80's and 90's. This particular Scania, from Autocar of Five Oak Green near Tonbridge has a particular claim to fame I wasn't aware of when I rode it. It is apparently the last step entrance decker built for a British operator. So a trip up to Rochester Airport beckoned. Sadly not the best pic. The traditional Scania power was in clear evidence but the legroom upstairs was negligible, which rather spoiled things. 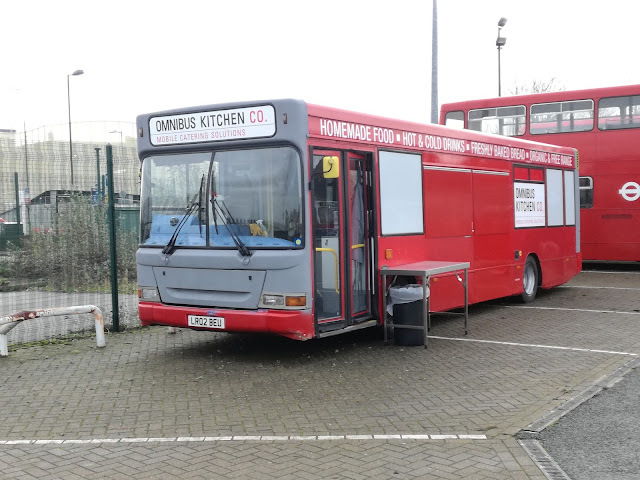 Take a few seats out and boy you have a bus there! Lunch beckoned, and Nu Venture had supplied an appropriate catering supplier. However with a burger costing more than the Dart did when new I gave lunch a miss and went in search of Kelvin. Who is Kelvin I hear you ask! Well Kelvin Pinnock is the owner of a special bus. Arguably, from a personal point of view the most important bus in the country. When I was going to school, waiting at a chilly bus stop with Foden tippers hammering by, if 5385 came round the corner I knew it was going to be a good day. Volvo Ailsas were different. Very different, more a truck with seats than a bus. Front engined, driver got in from the offside, unique layout upstairs, a glorious soundtrack and power. Lots and lots of power. 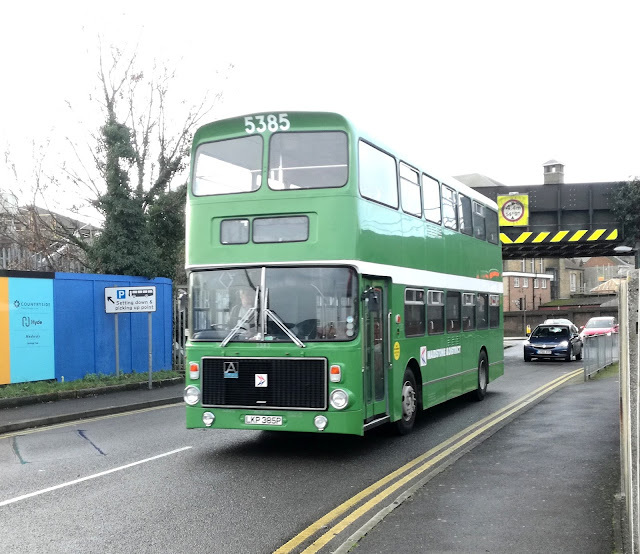 5385 survives, and thanks to Kelvin it feels exactly as it used to all those years ago. I clearly remember as a 13yo sitting on the engine cover chatting to a driver going out to the Isle of Grain and back on 5385. not sure I could do that now! Anyway getting to know Kelvin over the last few months on Twitter paid off as I was able to bag MY seat! The seat I spent so many hours in as a boy. The seat who if anyone else dared sit in it would result in unparalleled resentment. 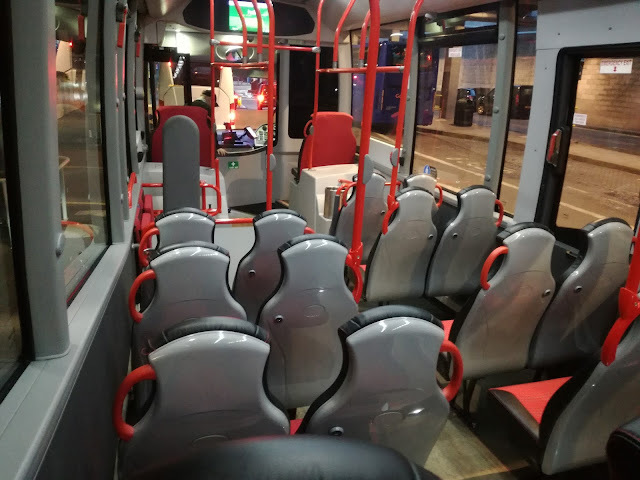 The best bus seat ever, anywhere in the history of buses. No one ever disturbed you there. The seat!! Not wanting to lose my seat for the return journey I declined the photo opportunity at Peter's Village, so I'm grateful to Kelvin for letting me use his. Even better while I have been writing the post Man of Kent has been in touch with a photo he took from the other side! Many thanks, pal. It was on the way back I had an idea. 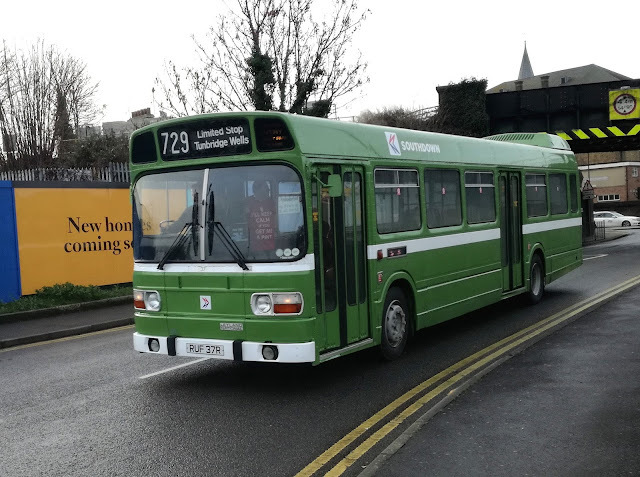 I've had many memories rekindled recently, but to get a photo of a bus I used to catch at the stop I used to catch it was an opportunity not to be missed. I popped downstairs and asked Kelvin if he wouldn't mind stopping for me. The gent that he is agreed, and although this may not be the best photo of a bus ever taken, for me it is pure gold and I'll admit to feeling quite emotional. The only thing missing is around 50 schoolkids pushing to get on! Kelvin, mate, you are a star. Thank you so much. There was still time for one more trip, and again on a bus I remember being in service. 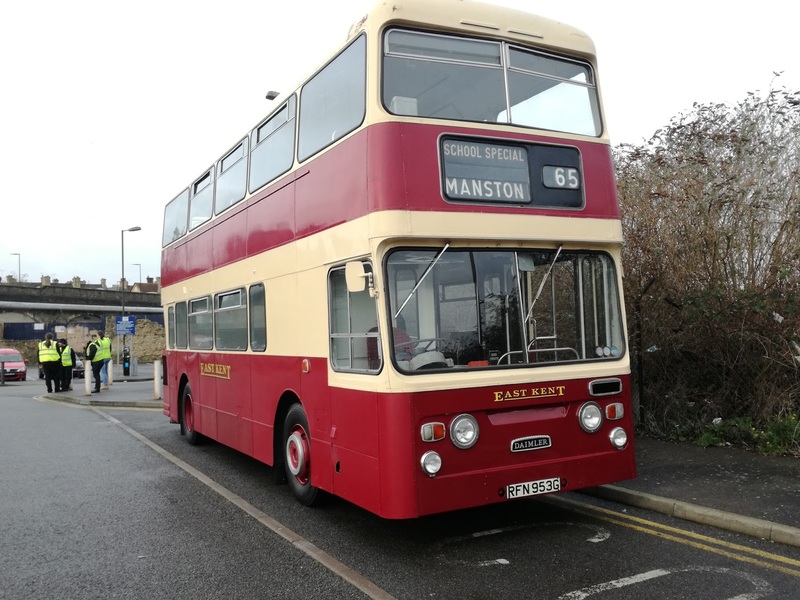 East Kent Daimler Fleetline RFN 953G is one of the more familiar vehicles on the Kent preservation scene, although it has recently changed owners. However I have not been on it since it entered preservation many moons ago so I put that right. I even stayed downstairs so I could listen to the deep rumble of the Daimler engine. And that was that. A superb day, superbly organised, and superbly attended. Thanks in no small part to Chris Jenkinson and everyone else at Nu Venture for making this right up there with the best days I had in 2017. Looking forward already to next year, although sadly due to a primary school about to be built on the coach park the event will be changing locations. Thanks to Matt, Matthew, especially Kelvin, and everyone else I met there. 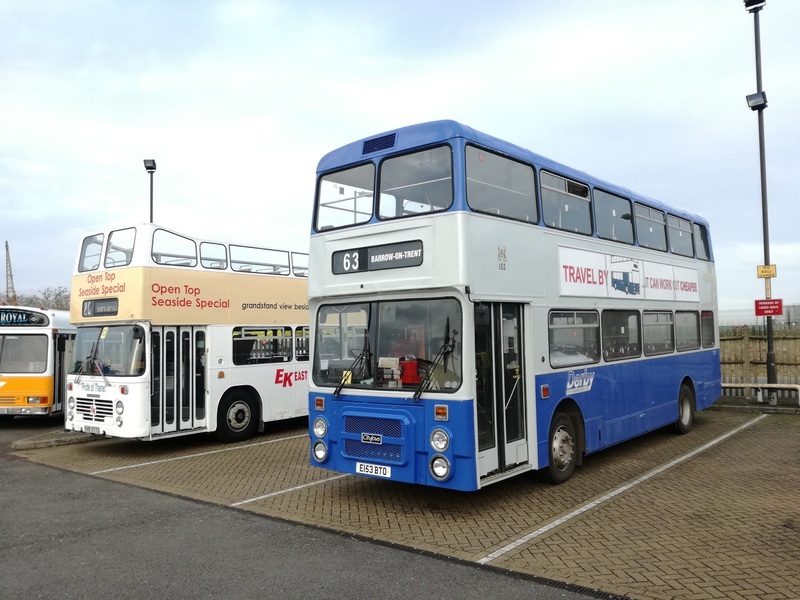 Thanks to all those bus owners who brought their pride and joys to the event. Oh - it was all free, no charge, no entrance fee, no you must do this before seeing the buses with the programme costing Matthew only 3 quid! Top marks. 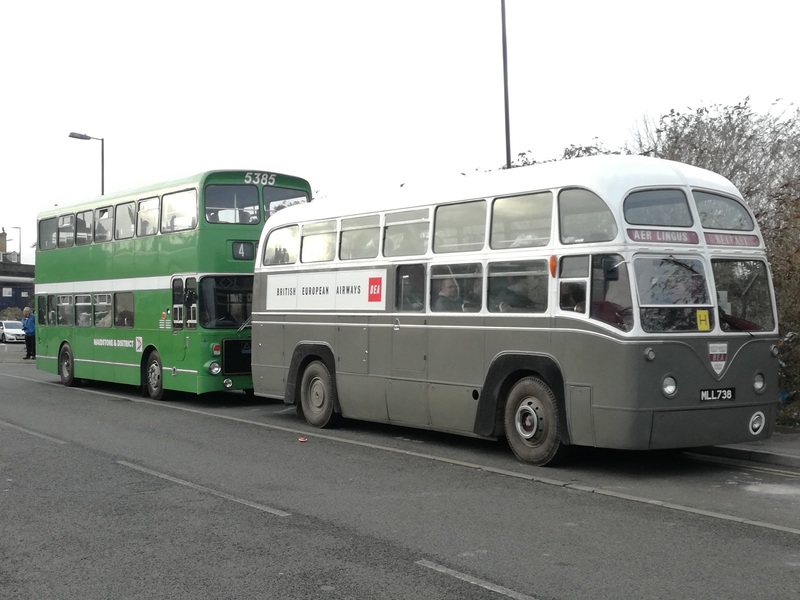 I'll leave you with a few other vehicles that turned up (no, Ensignbus I didn't forget you), finishing with the 2 best together! Happy New Year everyone.